In a move the New York Times descibed as "a dramatic escalation of the Trump administration’s effort to crack down on Chinese spying," United States authorities charged a Chinese intelligence officer with attempting to steal trade secrets belonging to the Cincinnati-based GE Aviation. CINCINNATI -- In a move the New York Times descibed as "a dramatic escalation of the Trump administration’s effort to crack down on Chinese spying," United States authorities charged a Chinese intelligence officer with attempting to steal trade secrets belonging to the Cincinnati-based GE Aviation. Xu Yanjun, also known as Qu Hui and Zhang Hui, was extradited from Belgium to the U.S. Tuesday on two counts each of conspiring and attempting to commit economic espionage and theft of trade secrets, Department of Justice officials and other federal authorities announced in a Cincinnati news conference Wednesday. Xu is the first Chinese intelligence agent ever extradited to the U.S. to stand trial. WCPO first reported about the investigation Tuesday after uncovering a then-sealed affidavit filed in March by FBI Special Agent Bradley Hull. The affidavit, which had been briefly posted on federal document storage site PACER, requested a judge's approval to continue an investigation into Xu's interactions with employees of three aviation-based companies. Among them was GE Aviation, which produces various aerial vehicles and technologies for the U.S. military. According to Hull, Xu approached representatives of each company intending to obtain information and passed it on to "a Chinese company that engages in the research, development, production, and sale of exhaust turbochargers, engine valves, cooling fans, and other engine parts." Xu is a deputy division director in the Ministry of State Security, the Chinese intelligence agency. 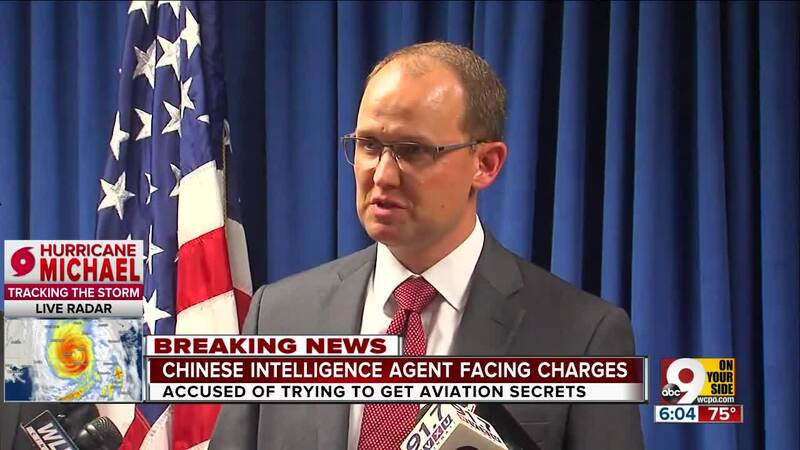 According to the indictment, Xu targeted aviation companies inside and outside the U.S. for trade secrets and other information starting in December 2013 -- possibly earlier. He identified experts working for those companies and recruited them to travel to China, often under the guise of delivering a university presentation. "This case is not an isolated incident," assistant Attorney General John Demers said. "It is part of an overall economic policy of developing China at American expense. We cannot tolerate a nation's stealing our firepower and the fruits of our brainpower. We will not tolerate a nation that reaps what it does not sow." The investigation had been going on for more than a year, according to U.S. Attorney Benjamin Glassman. He said a GE Aviation employee met with Xu in China and continued to communicate with him after returning to the U.S., which matched Hull's warrant request from March. According to that document, Hull believed Xu had recruited that employee the usual way -- inviting him to present at a Chinese university -- and, once he came to China, took information subject to "export controls" off the man's computer. FBI officers obtained their communications and Xu's communications with others connected to the scheme. 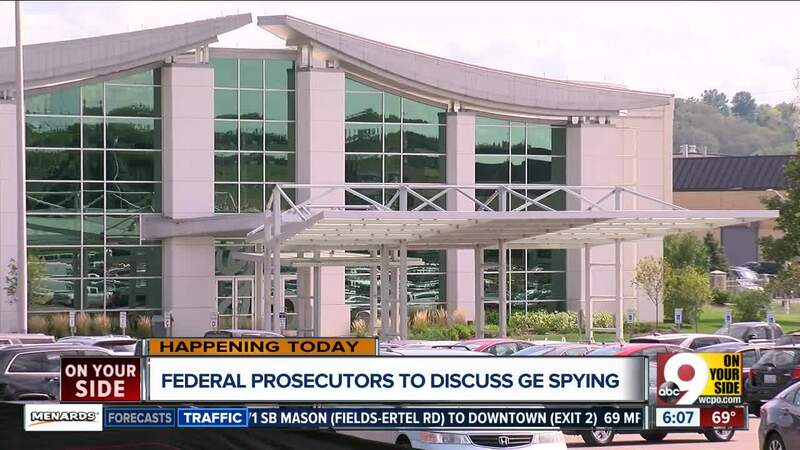 "For months, GE Aviation has cooperated with law enforcement in this matter," company representatives wrote Tuesday in a statement. "The impact to GE Aviation is minimal thanks to early detection, our advanced systems and internal processes and our partnership with law enforcement." The employee in question no longer works for the company, they added. Authorities arrested Xu in Belgium on April 1; he was indicted by a federal grand jury in Ohio before being extradited. This is the first time a Chinese MSS officer has been extradited to the United States to face trial, Glassman said. FBI Counterintelligence Assistant Director Bill Priestap said the case "exposes the Chinese government's direct oversight of economic espionage against the United States." If convicted, Xu faces as much as 15 years in prison for conspiring and attempting to commit economic espionage and 10 years for theft of trade secrets. "Innovation in aviation has been a hallmark of life and industry in the United States since the Wright brothers first designed gliders in Dayton more than a century ago," Glassman said. "U.S. aerospace companies invest decades of time and billions of dollars in research. This is the American way. "In contrast, according to the indictment, a Chinese intelligence officer tried to acquire the same, hard-earned innovation through theft. This case shows that federal law enforcement authorities can not only detect and disrupt such espionage, but can also catch its perpetrators." Xu will go on trial in federal court in Cincinnati, Glassman said. He was booked into the Butler County Jail Wednesday.